If you ventured into the shops, you’ll know that florals are everywhere. You’ll no doubt love them if you have a romantic style personality, but there are a few things to think about when you wear them. 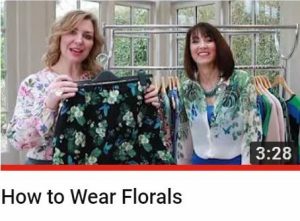 This is the second video in my new ‘Style Mojo’ You Tube channel where I’m partnering with fellow stylist Beth Price to bring you styling tips and advice in a series of ‘how to’ videos. Subscribe at the end of the video and you’ll be sure to hear about the latest trends as well as how to dress a fuller bust, smaller bust, bigger bottom etc etc etc. 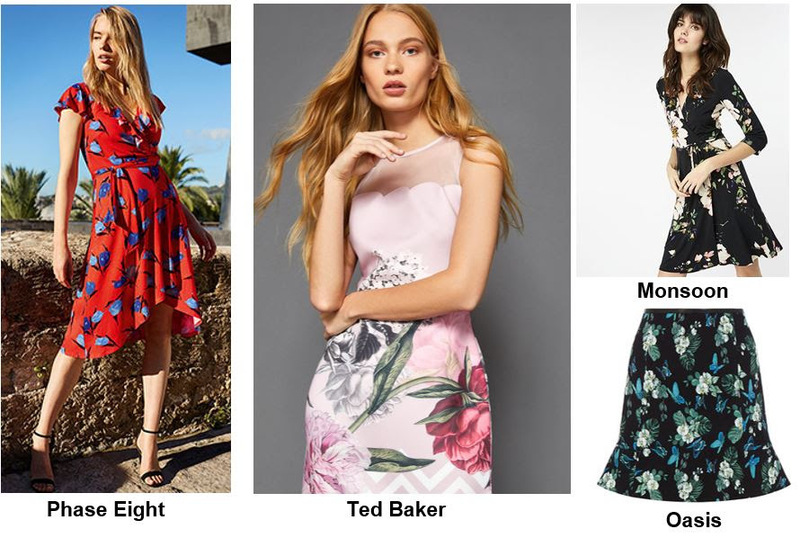 Firstly, think about the size of florals you choose – a big floral print, like that on the Ted Baker dress below, will overwhelm a smaller frame and a smaller print will look too insignificant for a bigger frame. Secondly, think about placement of the florals – wearing them in a top will draw the eye upwards, whereas a skirt, like the Oasis one below, will draw the eye to your bottom half. Do be careful of any tops that appear to have a flower literally positioned ‘on’ each breast too – you may find you get the wrong kind of attention! You’ll be surprised how many tops there are where this is the case! Don’t forget to think about the dominant colour for your floral pattern too. If you are a ‘Light’ colouring type you will look lovely in the Ted Baker dress for example. If you have Deep colouring then something like the Monsoon and Oasis florals will look great, and if you have Clear/Bright colouring then maybe the red & blue Phase Eight dress will take your fancy? If you’re not sure of the colours or styles of clothes (including patterns, like florals) that suit you best maybe now is the time to take the guesswork out of the equation and book your colour and/or style consultation.